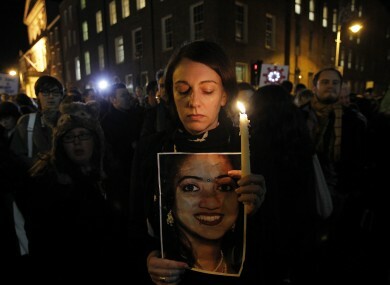 A vigil for Savita in Dublin last night. THE HEADLINE ON the main story on the India Times website today reads, “Ireland Murders Pregnant Indian Dentist”. While politicians here wait for the completion of two investigations, the international media has come to it’s own conclusions about what happened in University Hospital Galway last month after Savita Halappanavar, who was 17 weeks pregnant, presented with back-ache. Sky News led its lunchtime broadcast with the developing story yesterday, while British and Australian newspapers have filed numerous pieces on the events. Today, the coverage continued. The Hindu has reported that Indian authorities have expressed “concern” over the circumstances of the dentist’s death but said they would await the results of the investigations before taking the matter further. “We deeply regret the tragic death of Savita Halappanavar. The death of an India national in such circumstances is a matter of concern. Our embassy in Dublin is following the matter closely,” official spokesperson in the Ministry of External Affairs, Syed Akbaruddin said. Many American websites have covered Savita’s death using news wire Associated Press, but Fox News has also run an opinion piece by Dr Manny Alvarez who argues that “bureaucracy killed a woman”. We understand that the Irish authorities have initiated two inquiries. We are awaiting the results of these inquiries and we will take it from there. This is the sole image used to accompany Jezebel’s piece: Woman Denied Abortion Dies In Agony at Hospital. So awful, and yet another painful reminder of the many reasons women must have access to proper medical care. It appears this isn’t totally the work of neglectful hospital, the Irish government is to blame here, as well. In 1992, the Irish Supreme Court legalized abortion in cases where the mother’s life is threatened, but 20 years later the Irish Republic has failed to put the law into effect. The same website picked up on another issue raised in the Dáil this week – and covered by TheJournal.ie – that of the scandal of symphysiotomy. Author Katie J.M. Baker said she had never even heard of the procedure, which involves a woman’s pelvis being broken on purpose during labour. The survivors met to see the first screening of a documentary about the practice, which compares it to methods used in Kenyan hospitals today. But based on Savita Halappanavar’s tragic story — she was denied a medical termination in an Irish hospital even though she was miscarrying and in severe pain, and later died — it’s not like things have gotten all that much better for modern-day Irish women, either. TIME Magazine discusses the coincidence that an expert group’s report into the ABC judgement by the European Court of Justice, which found a disparity between the legal theory and actual implementation of Ireland’s abortion status, delivered its report the night before Savita’s death was made public. “The timing of the report’s publication and Halappanavar’s death are entirely coincidental but her death has thrust an already explosive issue into the forefront of Irish political debate,” writes Sorcha Pollack. If this were a cut and dry case of medical negligence, that would be tragic enough. But Savita’s ordeal and needless death reveals a wider disgrace: the shocking, inhumane treatment of pregnant women under Irish law. What the hospital seems to have done is to make a decision to put the woman’s life in danger to protect the rights of a foetus that had no chance of surviving. He adds that Ireland is now under pressure to address the contradictions in policy. Back closer to home, the Guardian has published a number of articles on the tragedy. To her family, I want to say: I am ashamed, I am culpable, and I am sorry. For every letter to my local politician I didn’t write, for every protest I didn’t join, for keeping quiet about abortion rights in the company of conservative relations and friends, for becoming complacent, for thinking that Ireland was changing, for not working hard enough to secure that change, for failing to create a society in which your wife, your daughter, your sister was able to access the care that she needed: I am sorry. You must think that we are barbarians. In the Daily Telegraph, Sally Peck notes that the High Court ignored the religious beliefs of a Jehovah’s Witness by overruling her signed, written instruction refusing a blood transfusion that would save her life. “So why on earth did they deny Mrs Halappanavar life-saving treatment?” she asked. Despite what you read in the anti-abortion press, terminating a pregnancy is not purely a cleanup operation after a messy drunken night out; sometimes doctors must make the difficult choice between the life of a mother and baby. And in that case, it is morally inexcusable, whatever your beliefs, not to prioritise the life that already exists. Ireland must act immediately to follow the 2009 European court ruling, before more women needlessly die in the name of religion. Political and cultural magazine, the News Statesman, points to the misinformation being disseminated in Ireland. …the reported facts suggest that Ireland’s abortion law, and its Catholic culture, were the context within which these horrific events unfolded. As recently as September, an “international symposium” meeting in Dublin declared that “direct abortion is never medically necessary to save the life of a woman”, though it added, confusingly, that “legitimate medical treatment” that resulted in pregnancy termination didn’t count as such. The statement claimed that “misinformation abounds in public debate” around this issue. But if it is misinformation, Savita’s death suggests that it isn’t just the public that is misinformed. Her doctors, too, appear to be labouring under the same delusion. Clarification of law is necessary, concludes Nelson Jones. Poll: Should Ireland legislate on the X Case ruling? Email “Savita tragedy continues to attract international attention”. Feedback on “Savita tragedy continues to attract international attention”.